HP designjet 5500 printer is a colour inkjet printer designed for printing high-quality maps and images. 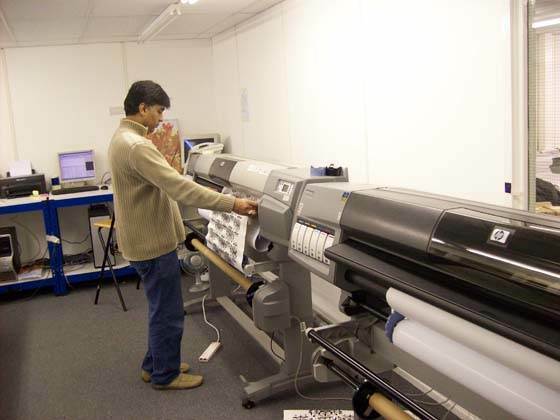 Production speeds of up to 569 ft²/hour (52.86 m²/hour) using Coated Paper with the Max Speed setting. Ultimate photographic quality using six inks and HP Colour Layering. Unattended printing using big 680-cc ink cartridges and rolls of paper up to 300 ft (91 m) in length. High productivity features such as queuing, nesting, and job previewing using the printer's internal web server. Exact ink and printing material usage information available from the front panel and from the internal Web server. Printing material and ink flexibility for any indoor or outdoor application HP No. 81 dye-based ink for indoor use. ICC profiles for Macintosh and Windows.